BLAINE, Washington, March 3, 2016 — The inaugural Northwest Wine Encounter at Semiahmoo, to be held April 15-17, features a weekend of wine, food and education with acclaimed Pacific Northwest winemakers: Bob Betz and Louis Skinner of Betz Family Winery, Darel Allwine of Col Solare, Chris Upchurch of DeLille Cellars, all from Washington State, and Joe Dobbes of Dobbes Family Estate, from Oregon’s Willamette Valley. The weekend program will be held at Semiahmoo Resort, Golf and Spa in Blaine, Washington, located on the shores of Semiahmoo Bay and Drayton Harbor, 45 minutes from Vancouver and 90 minutes from Seattle. The property has recently undergone a multimillion dollar renovation, reflected across its unique facilities and accommodations. The weekend begins Friday evening with a wine reception, where guests will sample some of the vintners’ favorite wines, as well as hear some of the stories behind them, as told by the vintners themselves. Saturday’s schedule opens with winemaker-led seminars covering Oregon Pinot Noir, Washington Syrah, and prestigious Red Mountain. Leisure time activities will include guided bird watching, walking, biking, kayaking, golf on one of Washington’s top two courses and spa services. Saturday will culminate with an intimate Winemaker Gala Dinner expertly crafted by Culinary Director Roy Breiman and Executive Chef Bruno Feldeisen and held on the Peace Arch Dock. On Sunday, winemakers from each winery will close out the weekend with a seminar on Northwest white wines. 4:00 – 7:00 pm – Arrival Check-in and resort activities at leisure. 6:30 – 8:00 pm – Meet the Winemakers Casual tasting with the opportunity to mingle with the Northwest’s top winemakers and wine experts. 9:30 am – Opening Remarks The inaugural Northwest Wine Encounter begins with an overview of Pacific Northwest wine country and a look at what will be tasted for the following two days. 10:00 – 11:00 am – Sublime World of Pinot Noir Explore Pinot Noir with Joe Dobbes, one of Oregon’s most famous and accomplished winemakers. Joe will pour some of his favorite expressions of his most beloved grape. 11:30 am – 1:00 pm – Lunch Dine at one of Semiahmoo Resort’s on-site restaurants. 1:30 – 2:30 pm – Succulent Syrah Washington Syrah is the crossroads between the Old and New Worlds. Take a deep dive into this luscious red wine grape with examples from Betz Family Winery and DeLille Cellars. 3:30 – 4:30 pm – Red Mountain Rising Red Mountain is Washington’s warmest, most exclusive and most important wine-growing region. 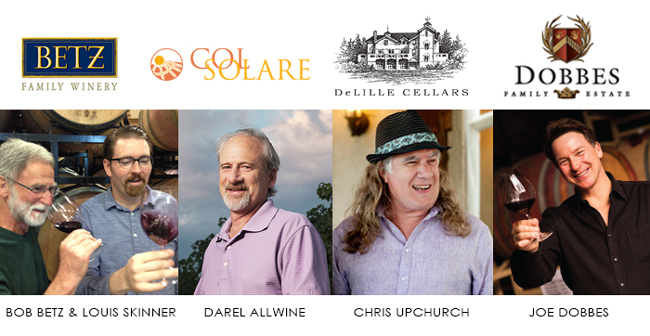 Learn why some of the world’s most famous wineries are coming to Red Mountain with DeLille Cellars and Col Solare. 4:30 – 6:00 pm – Time to Explore Explore the stunning beachfront resort and nature trails of Semiahmoo Resort. 7:00 – 10:00 pm – Winemaker Gala Dinner Get up close and personal with some of the Northwest’s top winemakers and wine experts at our winemaker dinner banquet at the Peace Arch Dock . Each table will be hosted by a Northwest wine luminary. The keynote speaker is Andy Perdue, wine columnist for The Seattle Times. 10:00 – 11:30 am – Wonderful Whites The Pacific Northwest is home to an amazing array of white wines, and the inaugural Northwest Wine Encounter concludes with an exploration of white wines including wine from Betz Family Winery, DeLille Cellars, Dobbes Family Estate and Ste. Michelle Wine Estates. The weekend package starts at $375 per person (based on double occupancy), which includes 2-night stay, Friday night wine reception, four winemaker-led tasting seminars and Saturday evening gala dinner (excludes tax and gratuities).